For starters, I wasn’t dressed right. Last Friday was a relatively nice spring day in the San Francisco Bay Area, and I went to the Apple Store in Emeryville directly from a meeting, so my only outwear was a wool blazer. But when I got down to Emeryville, a chilly wind was gusting down Bay Street; as the sun fell, it only grew chillier. The jacket wasn't nearly enough. For another thing, I was late. My meeting had gone until 3:00 p.m., so I didn’t get to the Bay Street mall until 30 minutes later or so. By then, the line was two blocks long. I walked past Victoria’s Secret, Gymboree, Sunglass World, Abercrombie & Fitch, and others before I reached the end of the line next to Arts Africains. The line continued to grow behind me, until it reached the end of the block and went around the corner. Those are two of the reasons I was shivering and sniffling in the gathering dusk at 6:30 p.m. when the guy from the Apple Store finally told us we should probably go home. By then, I’d had plenty of time to wonder what the heck we were all doing there. 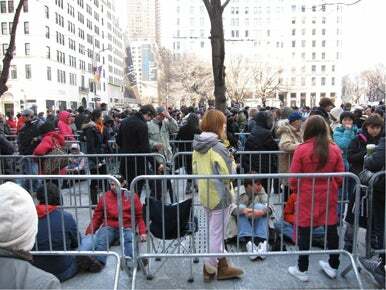 The crowd queues up in New York for the opportunity to buy an iPad 2 on launch day—a scene that repeated itself at Apple Stores across the U.S.
Actually, I knew why I was there: I’d been assigned to pick up a couple of iPad 2s for the office. (My shopping list: A white 32GB ATT model, a black WiFi with any capacity, and a blue Smart Cover.) It was my fellow line-standers I couldn’t figure out. It’s not like the iPad 2 is a mission-critical device for which anyone in line had a truly urgent need. I was standing next to a perky, energetic ’tween who was there with her parents and a friend and spent most of her line-time dashing in and out of nearby stores to get warm. A passerby asked why we were waiting in line and what we were waiting for. “It’s the awesomest toy ever,” she replied. The iPad 2 isn’t even a truly new device. As Jason Snell put it in his iPad 2 review, this version is an evolutionary product, not a revolutionary one. Look, I'm around Apple stuff all the time and, yes, I love a lot of it. But I wouldn't stand in line for three hours for any of it if I didn't have to. I usually try to argue against the stereotype of Apple fans, the ones who'll buy anything with that logo on it; I try to maintain that most of us are really sensible consumers who’ve made the rational decision that Apple’s products are better than the competition’s. But standing in that line doesn't seem too rational. The Apple Store staff at this particular location did not make the wait any easier. They did a lousy job of calibrating expectations. When I’d first arrived, we’d heard that we’d get cards at 4:45 p.m., on which we could indicate which models we wanted (with a limit of two per customer). That would have been great: Store employees could have compared those cards with their inventory and figured out whether or not they had enough iPads on hand. But those cards never arrived. Store people did come down the line once in a while, but they weren’t particularly helpful. One guy made a jokey announcement about line-cutters. (We’d have to police them ourselves, he said, because he was a wimp and couldn’t do it for us.) Finally, around 6 p.m., one of the Store people confirmed that there probably wouldn’t be any white models left when we got to the front. And, then, a half-hour later, he came back to say that there probably wouldn’t be any iPads of any color when our section of the line finally made it to the store. At that point I finally gave up. So did some of my fellow linesters. But as I walked away, hoping to find a warm beverage, most of the people in line hadn’t moved. Despite all evidence to the contrary, many of them still had hope.